Without doubt one of the most famous of the grand classic limousines was the Daimler DS420 indeed some of these impressive state vehicles are still owned by Her Majesty The Queen with three currently in the Royal Household one of which was in regular use by HM The Queen Mother, the Daimler DS420 Limousine being her favourite vehicle. The one shown above covers Dorset, Hampshire and Wiltshire area. These Limousines are still in regular use today by Heads of State and overseas Royalty when they visit the UK. They were produced up until 1992 with now only around 700 still in existence, originally, they were built in competition to the Rolls-Royce Phantom V which was heavily overpriced when compared to the Daimler that offered the same degree of luxury and grandeur. Nowadays they are also the ideal form of transport for the Bride and Groom as the space in the main cabin is enormous with plenty of room for the longest of legs to stretch out and for the fullest of wedding gowns, however being a limousine the DS420 can be adapted to carry up to 7 passengers when the occasional seats are in use so again also ideal for the Bridesmaids, Groom’s party and family members. 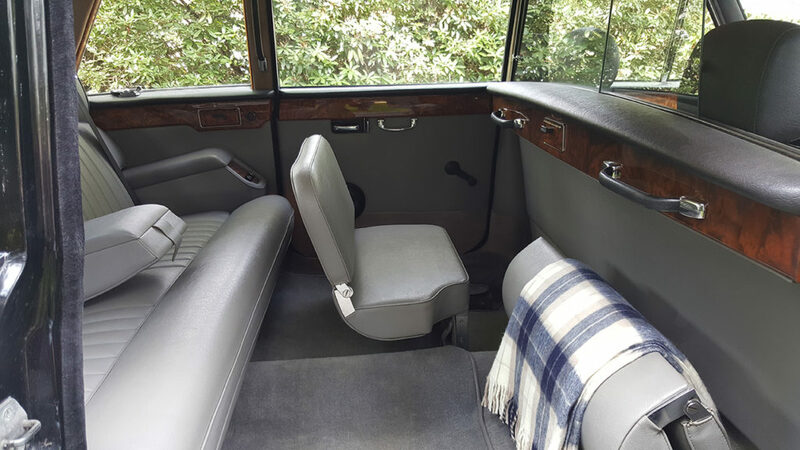 View the seating arrangement in this Bournemouth Based Daimler DS420 Limousine. As the Limousine can seat up to seven passengers it is the most cost effective way of transporting this number of people as two cars would normally be required for seven passengers and the cost would be much more than the cost of hiring just the one Limousine. The Daimler has appeared in many famous TV Series and Films, such as ‘Tomorrow Never Dies’, ‘Patriot Games’ and ‘Doc Martin’ to name just three. 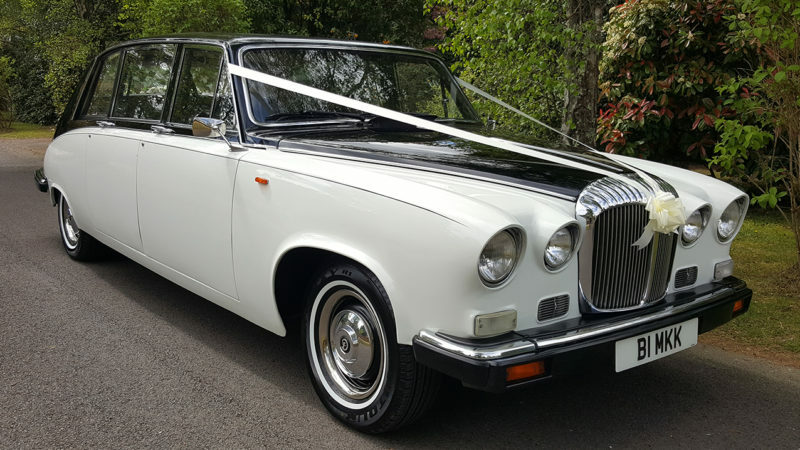 Premier Carriage is fortunate to have quite a few of the Daimler DS420 Limousines so they are available for wedding hire in most areas so do not hesitate to contact us for prices and availability.